On Sunday, April 28th, Faith United will have the joy of hosting Pastor Richard Jorgensen, our synod’s Director for Evangelical Mission, in worship. Pastor Jorgensen will bring greetings from the Lower Susquehanna Synod, preach, and join in fellowship with us. As Director for Evangelical Mission, Pastor Jorgensen works with congregations looking to be renewed in God’s mission by deepening their faith, reconnecting with one another, and re-rooting in their community. He is passionate about the whole church’s partnership in the Gospel and all of the ways that God’s love sets us free to serve together. 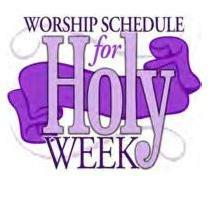 The North Lancaster Cluster of Lutheran Churches will begin their Lenten Worship Services series on Ash Wednesday, March 6, 2019 when each congregation will conduct Worship Services at their own Church. The Services will begin at 7:00 PM. Refreshments will follow each service. Theme: This year’s theme will be “The Five Solas”. The Five Solas are five Latin phrases (or slogans) that emerged during the Reformation to summarize the Reformers’ theological convictions about the essentials of Christianity. March 13: Faith United Lutheran Church, Denver, Pastor Bob Kramer (Interim at Bergstrasse) preaching on “Grace Alone” – Sola Gratia. March 20: St. John Center Lutheran Church, East Earl, Pastor Sandy Gideon (St. Paul’s, Adamstown) preaching on “Faith Alone” – Sola Fide. March 27: Muddy Creek Lutheran Church, Denver, Pastor Newell Embley (Interim at Faith United, Denver) preaching on “Word Alone” – Sola Scriptura. April 3: Bergstrasse Lutheran Church, Ephrata, Pastor Tim Craven (Mellingers, Schoeneck) preaching on “Christ Alone” – Sola Christus. April 10: Mellingers Lutheran Church, Stevens (Schoeneck), Pastor Tom Darr (St. John Center, East Earl) preaching on “Glory To God Alone” – Soli Deo Gloria. Thursday, May 30: Swamp Lutheran Church, Reinholds, Pastor Peter Schwabe-Fry (Muddy Creek, Denver). Ascension Day Service of Holy Communion. A 28-passenger bus has been reserved from “Elite Couch” to give members of the congregation the opportunity to attend her Ordination. The bus does have onboard restroom facilities and the cost would be about $37.00. We are allowed to eat on the Bus (No Glass Bottles) and we are looking at getting Pre-Package bag lunches for those who would want them (At extra Cost). If you are interested in going to Pastor Marissa’s Ordination and taking this bus, please see either Bruce or Jamie Carpenter. You can reach them at 717 336-5311 or batman@ptd.net. We are excited about our vacation bible school (VBS) being offered on Thursday and Friday, June 16th and 17th. Only it’s not really VBS as people normally think since it is meant to be family time. We are calling it “vacation camping days” because it is like a ‘small vacation’ in the midst of the busy weeks we all have. We are working with the Lutheran Camping Corp to provide two very special days. The afternoon start with the children and the activities– and we then invite parents to dinner and an evening family event. The kids start 2 PM each day with activities, projects and fun. Parents and teens are welcome to come help or if not able to help to just come at 5:00 PM for a meal followed by a family event. It will be a great time of being together as a family and expanding what you knowing of the community in which we live. See the attached registration. You are welcome to register by email to faithunited@ptd.net or dropping your form at the church.We appreciate earlier registration to help plan food needs and supplies.